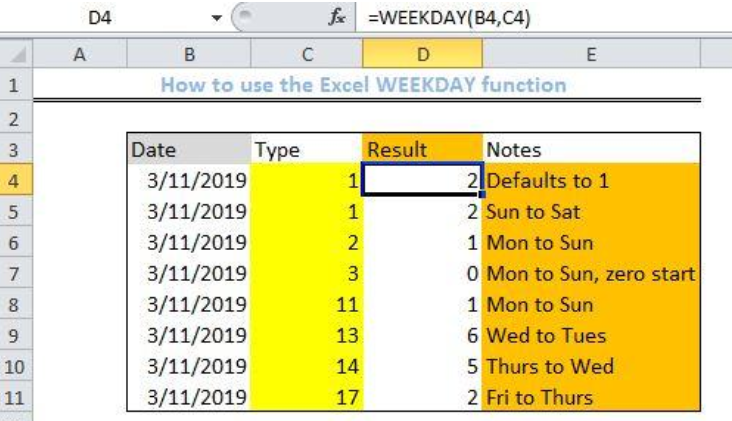 We can use the Excel WEEKDAY function to extract a weekday as a numeric value. This is an inbuilt function that is great for scheduling. In straightforward steps, we will walk through the process of using this function. 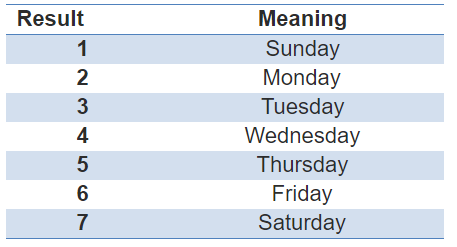 We use the WEEKDAY function to arrive at a number (between 1 and 7) that represents the day of the week. However, the mapping type would determine the outcome. 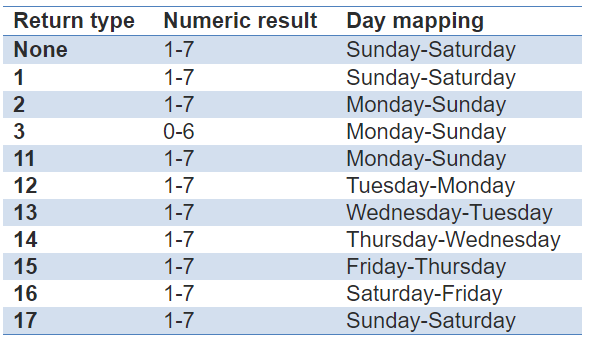 By default, 1 represents Sunday, while 7 represents Saturday. But, changing the mapping type will change the value of the outcome. The WEEKDAY function supports different mapping schemes. By changing the kind of argument, we will change the outcome. The table below shows the results and the associated mapping scheme. 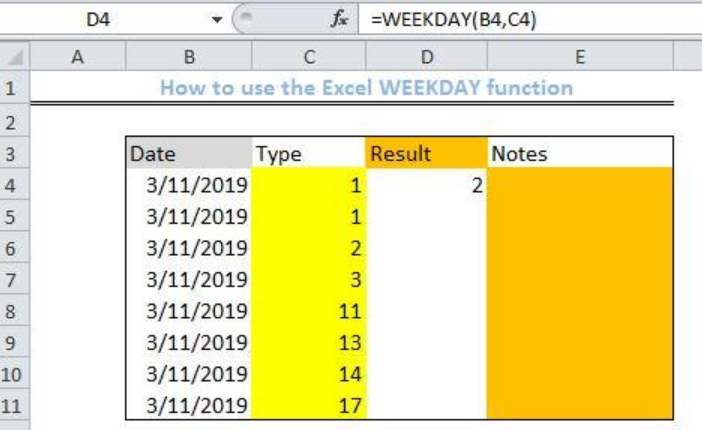 The WEEKDAY function will return with a numeric value even if the date parameter is blank. We can also use the WEEKDAY function to perform other operations such as creating custom weekdays or the Gantt chart. 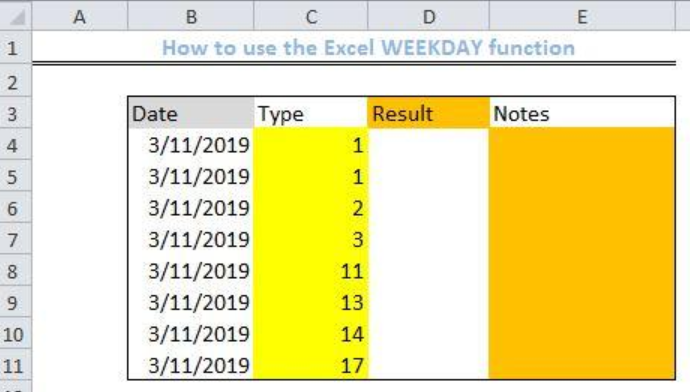 I need to find an INDEX function that will convert the Call Day (a number 1-7) to the actual weekday found in row 1 of the DayofWeek named range. I don't know if I'm supposed to use the MATCH function as well or not. 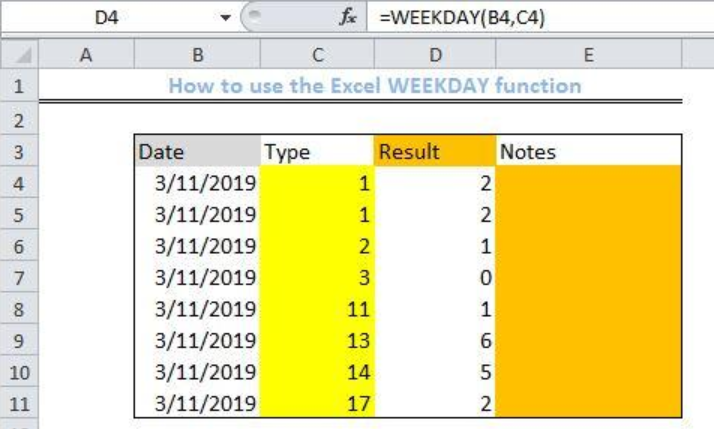 In cell J10, enter an INDEX function that will convert the Call Day to the actual weekday found in row 1 of the DayofWeek named range. Resize the column width as needed. Attached is an excel sheet which compares Weekday versus Weekend ADR. It starts in 2010 and ends in 2017. I need a line graph with 2 lines that shows these comparisons. It should be titled ADR and show which color of the line equates to either weekday or weekend. I need to convert date to a number, using weekday function. For example, with 13/5/2015, the weekday function doesn't work and shows #value error message. Making a dynamic gantt chart using conditional formatting, IF statements, WEEKDAY function, drop down menus, etc.